463 Beacon is located on the south side of Beacon, between Hereford and Massachusetts Avenue, with 461 Beacon to the east and 465 Beacon to the west. 463 Beacon was designed by architect Edgar A. P. Newcomb and built in 1887-1888 by Charles A. Dodge, mason, one of two contiguous houses (463-465 Beacon). It was built as the home of Frank Gair Macomber and his wife, Clara Elizabeth (Robison) Macomber. Frank Macomber is shown as the owner of 463 Beacon on the original building permit application, dated June 15, 1887, and on the final building inspection report, dated August 13, 1888. 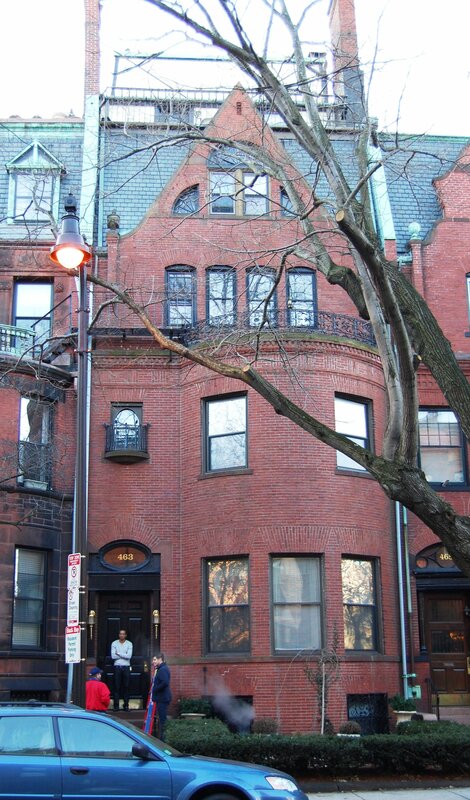 Clara Macomber purchased the land for 463 Beacon on May 18, 1887, from architect John Hubbard Sturgis. The lot was part of a 375 foot parcel he purchased on January 24, 1880, from a real estate investment trust formed by Grenville T. W. Braman, Henry D. Hyde, and Frank W. Andrews. The trust had purchased the land from the Boston Water Power Company on March 1, 1872. The 375 foot parcel was one of three John H. Sturgis had purchased in January and February of 1880 comprising all of the land on the south side of Beacon from a line 198 feet west of Hereford to Massachusetts Avenue, with a frontage of 442 feet. 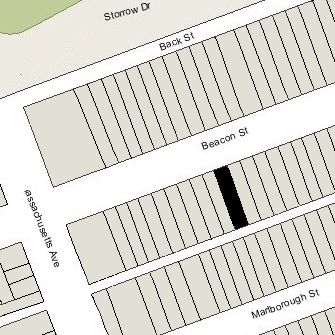 Click here for an index to the deeds for 463 Beacon, and click here for further information on the land on the south side of Beacon between Hereford and Massachusetts Avenue. 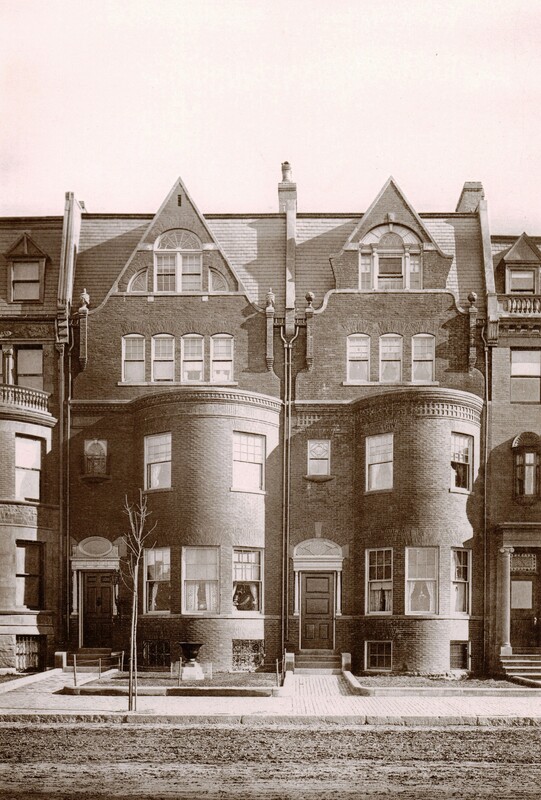 The Macombers were first listed at 463 Beacon in the 1888 Blue Book, which would imply that they took up residence there during the 1887-1888 winter season. However, based on the dates of the building permit application and final inspection report, it appears unlikely that the house was completed before the spring of 1888. They previously had lived at 45 Hereford, which they sold in May of 1887, and probably had intended to be in their new home the coming winter, but encountered delays in construction. There is a similar discrepancy between the Blue Books and Building Department records with respect to 465 Beacon. The Macombers also maintained a home in Marblehead. Frank Macomber was an insurance broker. He also was a noted antique and art collector, and was honorary curator of decorative arts at the Boston Museum of Fine Arts, to which he contributed his collection of tapestries. Clara Macomber died in November of 1932. Frank Macomber continued to live at 463 Beacon there until the mid-1930s, when he closed the house and liquidated much of his art collection. A number of valuable art objects were stolen at that time, and in October of 1937 his former caretaker, David F. Hodgdon, was arrested and pled guilty to the theft. 463 Beacon was shown as vacant in the 1938-1939 City Directories, and it appears likely that the penthouse addition was erected at this time. On December 27, 1938, 463 Beacon was acquired from Frank Macomber by William Karmazine. The next day, he transferred the property to Phyllis A. Goodman. William Karmazine was president of the Commercial Finance Service Corporation, and treasurer of the Home Loan Co., Inc. He and his wife, Edna (Nurenberg) Karmazine, lived in Chestnut Hill. Phyllis Goodman was an employee of the Commercial Finance Service Corporation who acted on behalf of William Karmazine in various real estate transactions. On November 9, 1939, Phyllis Goodman transferred 463 Beacon to Bertha Askenazy of Malden, who also held it on behalf of William Karmazine. In December of 1939, William Karmazine applied for (and subsequently received) permission to convert the property from a single-family dwelling into a lodging house. On March 15, 1940, Bertha Askenazy transferred 463 Beacon back to William Karmazine as trustee of the Esdith Realty Trust, which he had established to hold property for the benefit of his two daughters, Esther Reece Karmazine and Judith Shaefer Karmazine. and his niece, Enid Esta Karmazine, daughter of his brother, Nathan Karmazine and his wife, Mae (Lipsher) Karmazine. He operated 463 Beacon as a lodging house with various resident housekeepers. On January 2, 1946, 463 Beacon was acquired from William Karmazine by Emma Dora (Cunningham) Harrison, the wife of John Alfred Harrison, a retired court reporter. They previously had lived at 38 Fairfield. They operated 463 Beacon as a lodging house. John Harrison died in the early 1950s. Emma Harrison continued to live at 463 Beacon until about 1966. On August 30, 1966, 463 Beacon was purchased from Emma Harrison by Anthony Wine, who continued to operate it as a lodging house. He and his wife, Shirley Jean Smith (Smith) Wine, lived at 311 Beacon, where they also operated a lodging house. On December 20, 1988, 463 Beacon was purchased from Anthony Wine by Bernard Gelber, trustee of the 463 Beacon Street Realty Trust. He lived in Brookline and continued to operate 463 Beacon as a lodging house. The beneficiaries of the trust were Bernard Gelber (90 percent) and his mother, Shirley (Levine) Gelber, the widow of Albert H. Gelber (10 percent). Shirley Gelber died in March of 1992, and her interest in 463 Beacon was inherited by her three children: Robert E. Gelber, Bernard Gelber, and Irene (Gelber) McCrensky, the wife of Allan McCrensky. In December of 2009, the 463 Beacon Street Realty Trust terminated under its own terms and the property was distributed to the beneficiaries. On December 28, 2011, Robert Gelber and Irene McCrensky transferred their interests to Bernard Gelber. On March 9, 2012, 463 Beacon was acquired from Bernard Gelber by the 463 Beacon LLC (Wenhua Jiang, manager). 463 Beacon remained a lodging house in 2017.